This is it, my lovely, lovely Janeites. We have once again come to the end. (Well, for now, at least.) 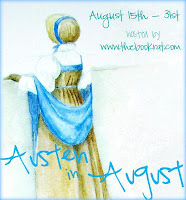 I want to give a BIG THANK YOU to everyone who participated in Austen in August this year! All of the contributions - guest posts, giveaways, excerpts, and all of the lovely things you did - helped make this awesome, and I thank you very sincerely for taking part. I want to thank all of you who stopped by and read, too, or did your own AiA posts on your blogs/vlogs - it never ceases to amaze me every year just how many of you there are and how enthusiastically you join in. Much, much <3. Feel free to continue to browse through and see what you missed (I know there was a lot), and keep entering the giveaways - they'll all be open until September 5th. Full acknowledgements are at the bottom of this post, and I strongly encourage you to support the participating authors and blogs, and check them out when you have a chance. And for now, I'll leave you with a little Janeite treat. A big thank you to YOU, Misty, and all the readers here. It's been a brilliant 2 weeks, with something for everyone. It has obviously been a lot of work for you, but you seem to enjoy every minute! Thank you, Misty, for all your hard work. It's been a lot of fun! Cheers to nxt year's ! .. I enjoyed reading along. I don't believe I was much of a visitor before to your blog and I found it delightful. The amount of authors etc was outstanding and so much fun. Thank you all for your contributions.